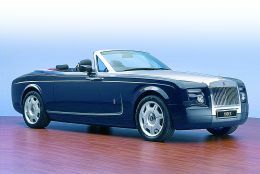 Rolls-Royce was born in England in 1904, the automobile house whose name still today is the stuff dreams are made of. In 2004, with one hundred years of automobile history behind it spent creating luxury and perfection, the automobile sector of this prestigious British firm is today controlled by the German BMW, but the desire to stand out with distinction is as strong as ever. So to celebrate the anniversary of its first 100 year and confirm its essence as a luxury brand, first on occasion of the Geneva Car Show and then in Italy at the prestigious gathering of elegance at the Villa d'Este, this English house presented its 100 EX prototype, with EX standing for Experimental, the same abbreviation used from 1919 to the end of the fifties for those models that were the testing bench for the technical and style skills of this Crewe-based company. This is how the designer Marek Djordjevic himself describes the spirit that inspired him while designing: "The overall impression is intended to be of an elegant motor yacht at speed", and it seems to us that this goal has been achieved. Conceived in the Californian BMW style centre, directed by Jan Cameron, this EX certainly does not pass unobserved. "Smaller" than the saloon Phantom, from which it gets its engineering, it is however impressive with its 5669 mm in length and its 1990 mm width. It has a powerful yet very elegant line, and the enormous 21-inch aluminium wheel rims contribute to balancing out its proportions. Even the evergreen neoclassic radiator grill, topped by the legendary mascot "Spirit of Ecstasy", here in solid silver, has had its corners rounded (sacrilege?) 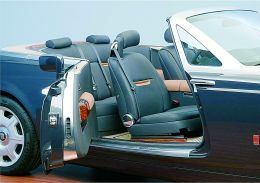 to make it more "nautical" and the two immense coach doors give it appeal from the past. 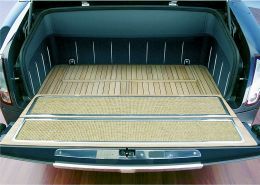 But it is the interiors that really bewitch the "sailing" eye: this prototype sports one of the most successful colour combinations of blue leather and bleached teak decking; the hood cover is finished in fine wood and the resemblance to a super- yacht is unmistakable. The hood itself, when freed from the treasure chest that contains it, emerges as a multi-layer beige nautical canvas, with a pure cashmere lining. Lots of aluminium for the very unusual windscreen surround as well as for other important parts of the body and chassis. As far as the mechanical specifications are concerned, this "yacht of the road" is powered by a 9-litre naturally aspirated V16, 64- valve engine and suspensions are shared with the Phantom: articulated quadrilateral the front and multi-link the rear. Production of this dream car, if it happens, will be limited to 35 examples of which only 3 for Italy, so if you are interested.hurry! The price and fuel consumption? If you need to ask, this is not the super-yacht-car for you! Copyright © 1995-2019 Nautica Editrice S.r.l. - Via Tevere, 44 - 00198 Roma (Italy) - Phone +39-06-8413060 - Fax +39-06-8543653 - E-mail - PI 00904971009. This web page is a service provided by Nautica On Line ® magazine, registered on 19/12/1995 at no. 620 and on 7/07/2003 at no. 302 in the Court of Rome's Press Register.